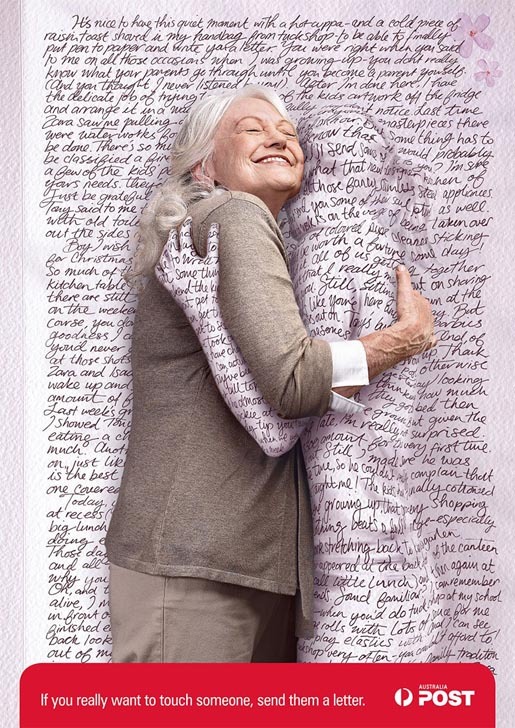 Australia Post portrayed the letter as the most effective way of keeping in touch with these print advertisements. The tagline: “If you really want to touch someone, send them a letter”. Originally the advertisement was created to appear in a defense force magazine to highlight the role that Australia Post plays in keeping defense personnel in contact with loved ones. However it was so well received that Australia Post decided to run it in other magazines in the lead up to Valentines’ Day. It proved so popular in showcasing print as an advertising medium, that one publication even re-ran the ad for free. Yet more positive feedback emerged from these additional insertions and a second concept was developed to coincide with Mothers Day. The print advertisement was developed at M&C Saatchi, Melbourne, by creative director Steve Crawford, head of art Murray Bransgrove, art director Rebecca Hannah and copywriter Doogie Chapman, with photographer Christopher Tovo and retoucher Ed Croll.